The number one skill employers are looking for is the ability to communicate effectively. Communication is a social process by which human beings are linked through the creation, transmission, and reception of messages from which meanings are generated. The focus of this program is the scholarly analysis of that linkage, with an emphasis on the characteristics of the messages and channels through which linkage occurs. 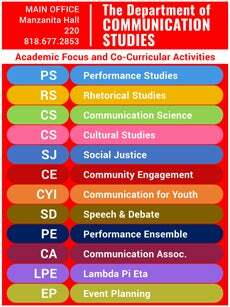 The Department of Communication at California State University is committed to teaching theory, and the skills necessary to expand and deepen students’ understanding of the role communication plays in a globalized world through Performance, Rhetoric, Cultural Studies and Communication Science. Graduates of the program are positioned to pursue a wide variety of career paths in areas such as: Public service, non-profit sector, public relations, consulting, training and development, public administration, media campaigns, human resources, law, politics, among many others.